The Church is located on the Kettering Road (A5123), approximately one and a half miles north-west from the centre of Northampton in the area known as Kingsley. The Parish Centre is located to the rear of the church on The Drive. The church is open for visits and private prayer from April to October on Saturdays (12 noon till 4.00pm) and Bank Holiday Mondays (2.00pm till 4.00pm). Visits outside these times can be arranged by prior appointment. Please contact the Parish Office during office hours. Discover where we are and get directions to the church, Parish Office and other areas of the Parish. The Diocese of Peterborough unites around 360 Anglican churches in Northamptonshire, Rutland and the Soke of Peterborough. The roots of the Church of England go back to the time of the Roman Empire. Discover more about the Church of England. Set in two acres of beautiful landscaped gardens, its aim is to support the independence, choice and preferred lifestyles of all residents in a homely, stable and Christian environment. 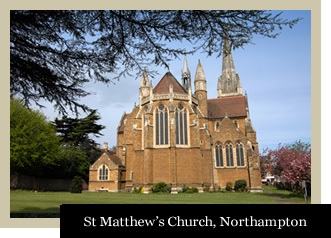 St Matthew’s is one of the local churches listed on their extensive website. St Matthew’s is one of the local churches listed in the 'Explore Churches' area of the website.